It is the one time during the year I think about all those family dinners past, especially when I was a kid. It was when all those old (to me at the time) relatives came over, and drink in hand, told tales of their childhoods. Sometimes the stories were about my parent’s childhoods, much to their embarrassment, like when my Dad blew up their basement with his chemistry set. Uncle Trygve told about the road trips on his Harley and my Mom smilingly recalled my brother’s stuffed dog that had the hair all worn off and the stuffing totally gone from the neck so it flopped around. One time she forgot it at my Grandpa’s house, got home and realized its absence, and had to drive all the way back to retrieve it. My Grandma talked about her Danish father who was a ships sailmaker, and Great Uncle Max, whom we never told tales about, because we knew he had embezzled money to give to a friend to start a company. It wasn’t even for himself, but he got caught and went to jail. Well, now I am the oldest one at the table and I get to tell stories about my kids childhoods and mine. Isn’t Thanksgiving just the best? My Thanksgiving dinner must include the turkey, stuffing in the bird, gravy and cranberry jelly. 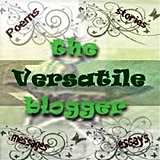 Mashed potatoes are optional, but I usually make them, and two or three vegetable side dishes. I hate to admit it, but I love that green bean and fried onion casserole, and the sweet potatoes with brown sugar and mini marshmallows, although I never make them now. They are a dear memory from that childhood table, along with canned fruit salad with sliced bananas, apples and orange added and mixed up with whipped cream. My Mom used to make the sage dressing from scratch, and after the bird was stuffed the night before, she would put the roaster in the back seat of the car in the garage, because it wouldn’t fit in the fridge. This was in Minnesota, so the end of November was really cold, sometimes with snow on the ground. It’s funny how, in order for Thanksgiving to be right, it must have the dishes from our childhood feasts. This cauliflower dish is a perfect side to accompany turkey, because the lemon juice has just the right acid note as counterpoint to the richness of the gravy. Melted butter, lemon juice and Poupon mustard are mixed together and coat the slices of cauliflower. The cauliflower is baked until the undersides are richly browned and the lemon juice is reduced to a mustardy piquancy. Your guests are going to get a big surprise at that first bite. Look for it. 1. Preheat oven to 400 degrees F. Position rack on middle of oven. 2. Line baking sheet with aluminum foil and rub on 2 teaspoons butter. 3. 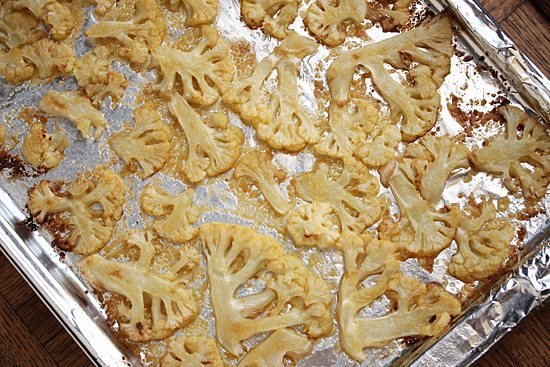 Cut cauliflower in half, then cut crosswise into 3/8 to ½-inch slices. 4. Arrange slices in single layer on buttered baking sheet. Sprinkle with salt. 5. Roast until cauliflower is slightly softened, about 15 minutes. 6. Melt ¾ stick butter in small saucepan over medium heat. Whisk in lemon juice, mustard and lemon zest. 7. 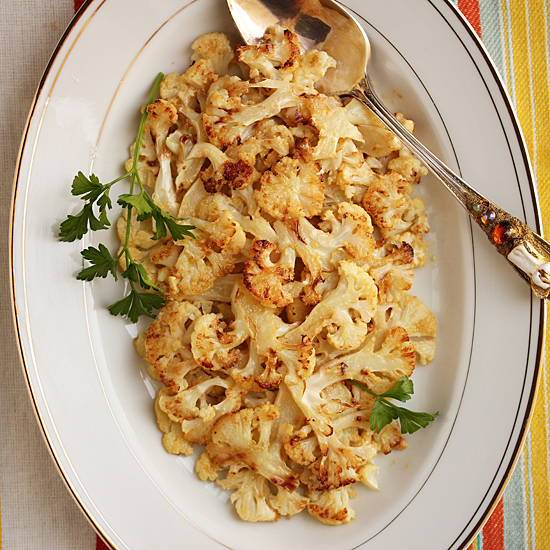 Spoon lemon-mustard butter evenly over cauliflower and roast until crisp-tender, about 10-13 minutes longer. 8. Transfer cauliflower, browned side up, to serving platter and sprinkle with parsley. Serve warm or at room temperature. I could say “poupon” all day. Isn’t it the cutest word? 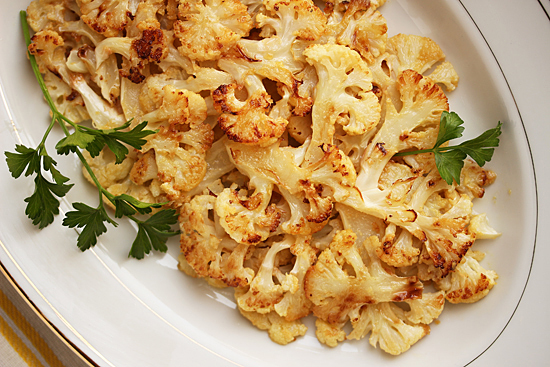 Never roasted cauliflower w lemon & mustard – this looks delicious. 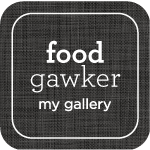 I have been in the mood for cauliflower — I love it but my wife isn’t crazy about it, and I was eating alone last night. I decided to give your recipe a try to accompany some leftover turkey meatloaf I was eating. I really enjoyed the flavors! I started with a scant half-head of cauliflower and decided to cut back on the butter since it was just me and it wasn’t Thanksgiving yet, but I think it turned out quite well. 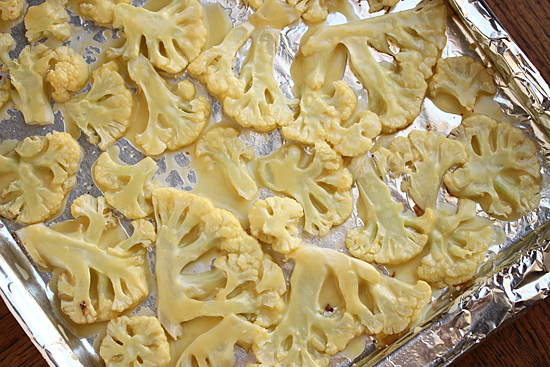 I used non-stick aluminum foil and decided to do the roasting in one step — I melted 1.5 tbsp (unsalted) butter and whisked in some fresh lemon juice and about 1 tsp of dijon, spooned it over the cauliflower, tossed it gently, salted, and roasted in the oven for about 22 minutes. The cauliflower browned nicely and was cooked perfectly to my taste. I’ll definitely make this again — and hopefully my wife will love it as much as I did! Thank you for the recipe and inspiration!